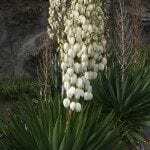 When is the best time of year to move yucca plants (fall or spring)? Actually, both. While spring or fall is generally the best time for transplanting, these hardy plants can be moved quite easily at any time.